Hematopoietic stem cells (HSC), which are responsible for maintaining continuous pool of blood cells, are being used for bone marrow transplantation (BMT). However, the programmed cell death/ apoptosis poses a serious problem for their optimum proliferation and differentiation after radio- and/ or chemotherapy. The role of Bcl-2 (B Cell Lymphoma) protein, a Bcl-2 family member, is well established in suppressing apoptosis of HSC on irradiation and serum withdrawal. The anti-apoptotic activity of Bcl-2 is regulated by inter- and intra-family homo-/ heterodimerization. Here we are proposing that the potential of Bcl-2 and its survival enhancing mutants, such as D34A and S70E, may be harnessed (gene therapy) to suppress the radiation and growth factor withdrawal induced apoptosis provided the neoplastic outcomes of these genes are regulated. The suggested hypothetical model is likely to be helpful in treating blood borne disorders and radiation injury through BMT. 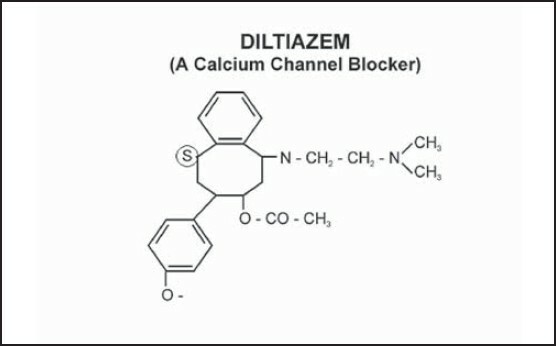 Intraperitoneal administration of diltiazem (DTZ), half an hour prior to whole-body gamma irradiation (5.0 Gy), showed the protection of animals from radiation-induced micronuclei in bone marrow. The frequency of micronuclei elevated from 6 to 24 hrs. 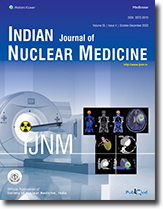 post-irradiation in both irradiated groups but declined thereafter. The counts of micronuclei were found to be significantly lower in DTZ treated irradiated group and it restored to normal on 7th day, while the normal number of micronuclei observed in control group only after 28 days post-irradiation. These data demonstrate that DTZ protects mice bone marrow against radiationinduced micronucleus formation. More than one center of ossification is frequently found in asymptomatic children and adolescents and is regarded as a normal variant. Accessory navicular bone is one of the supernumerary ossicles in the foot. It may present incidentally or may be present with clinical manifestations. Radiograph is non diagnostic in symptomatic cases. 99mTc MDP bone scan shows focal intense uptake. Advantage of three phase bone scan over single delayed skeletal phase in the diagnosis of symptomatic accessory naviculars and it's clinical significance in foot pain was retrospectively analyzed in ten cases of accessory naviculars (five unilateral and five bilateral) in the present study. Bone scans were correlated with radiographs. Intense hyperemia in initial phase and focal intense uptake in delayed phase was taken as characteristic feature for symptomatic accessory navicular. All the symptomatic accessory naviculars (100%) showed positive three phases. Only two out of eleven asymptomatic accessory naviculars (18%) showed positive hyperemia in the initial phase whereas rest showed absence hyperemia. Our study concluded that additional vascular & bloodpool phases improve sensitivity and specificity in diagnosing symptomatic accessory navicular as the main cause of foot pain. We present a 40-year-old male who had myocardial infarction (MI), 48 hours following a road traffic accident. EKG showed anterior wall MI and complete heart block. 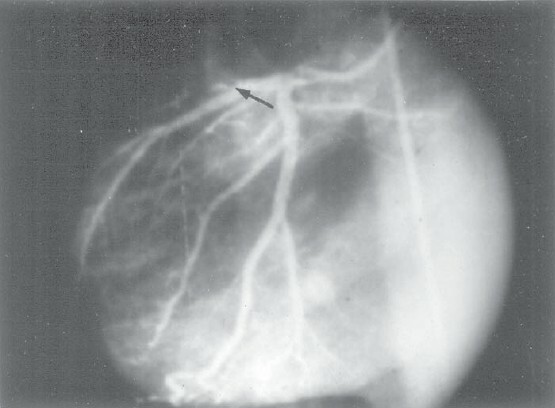 Tc99m-Pyrophosphate scan and angiography confirmed the diagnosis. The possibility of traumatic MI should be considered in cases of chest trauma and the patient should be observed for 48 hours. Pyrophosphate scintigraphy can be useful in these patients. 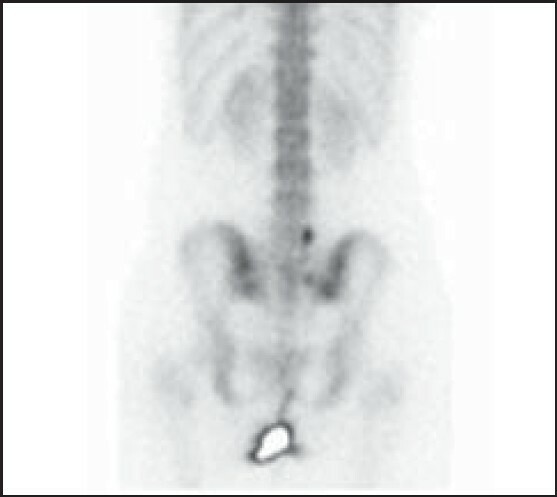 Bone scintigraphy is routinely performed to identify bone and joint abnormalities in patients with low back pain.Urinary contamination by radiotracer excreted through the renal route may complicate scan interpretation, especially when localized to the symptomatic anatomical region. We present such a case where urinary contamination simulating a bony abnormality on the planar image was clearly identified only on SPECT.